Lasagna of all kinds are great for potlucks or to feed a crowd. You don’t have to tell your friends and family that this one is gluten-free and dairy-free, and because this lasagna has so much flavor, odds are they won’t notice anything is missing. Since lasagna is a pretty forgiving medium, please feel free to experiment with adding cheese and/or substituting mushrooms for Italian sausage, or adding extra vegetables like eggplant & zucchini. There’s so many possibilities! Directions are for a 13x9x2 inch baking dish. First, bring a big stockpot of water to a boil, then add salt, and follow the directions for cooking your lasagna noodles. I recommend Tinkyada Brown Rice Lasagna Noodles, which I like to cook for 11 minutes instead of the listed 13 minutes so that they are less likely to break apart. If you’re trying to guess how many to cook, try laying them out dry in the baking pan so you can visualize how many noodles it will take to make 3 layers, then cook 1 or 2 extra just in case. Once they’re done cooking, drain and rinse them with cold water until they’re cooled, then spread them on a piece of wax paper until you’re ready to build your lasagna. If you need to stack the noodles, dab or spray them with oil to keep them from sticking to each other. Pour in the wine and your chili flakes, if you’re using them. Allow the wine to de-glaze the pan for a minute while stirring, then pour in the crushed tomatoes. Bring to a simmer and allow to bubble gently for 15-20 minutes, then add sugar, salt, balsamic vinegar & pepper to taste. Simmer for at least 5 more minutes while you assemble the rest of the ingredients. Toss everything in a food processor and blend, adding a drizzle more of olive oil if need be. Taste and add salt, more oil or nuts or lemon as you desire. 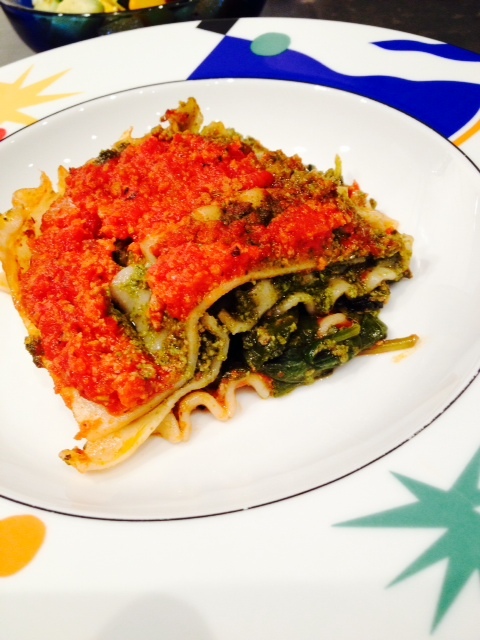 Grab your 13x9x2 inch baking dish and huddle the sauce, noodles, spinach, and pesto within reach. Start by ladling about a 1/3 of the sauce into the pan, then create a layer of noodles (you’ll probably need to trim them or cut them in half with a knife so that they fit). Now spread 1/3 the pesto onto the noodles, then 1/3 sauce, then cover with half the spinach, then another layer of noodles. Then, 1/3 pesto & and rest of the spinach, and another layer of noodles. Top it off with the remaining pesto and sauce and you’re ready to bake! Cover lasagna with foil and bake for 30 minutes. Uncover and bake an additional 15 minutes. Once you pull it out of the oven, let sit about 15 before serving. Enjoy!